Dawlish railway repairs in two minutes Jump to media player Time-lapse footage of the two months of repairs to the coastal railway line at Dawlish in Devon. Dawlish railway line: Before and after Jump to media player How the coastal railway line at Dawlish looked after the winter storms - and how it looks now. Dawlish train battered by waves Jump to media player One of the last trains to use the railway track at Dawlish before the line was closed has been captured on video. 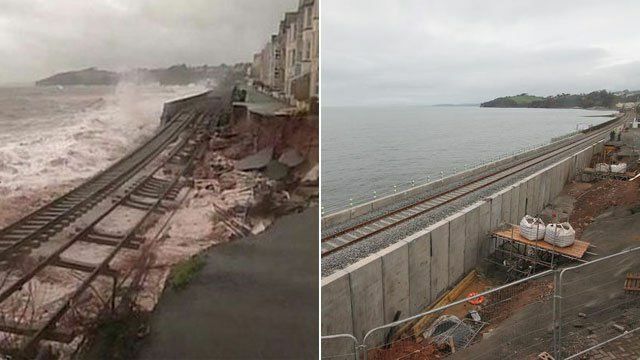 Dawlish track before and after storm Jump to media player Archive footage shows how the train line at Dawlish looked before Tuesday night's storm, and subsequent pictures show the damage caused by rough seas. Dawlish defences damaged again Jump to media player Shipping containers being used as a makeshift sea wall to protect damaged tracks at Dawlish have been damaged by Friday's stormy weather. The coastal railway line at Dawlish in Devon which was damaged in the winter storms is being reopened to trains on Friday. About 260ft (79m) of sea wall was destroyed by high tides and stormy seas on 5 February causing a stretch of railway to collapse. Another storm several days later caused more damage which has now been fixed at a cost of £35m. This time-lapse footage shows the two-month repair effort in just two minutes.